Regd. # 229 or 230?? at Lane Cover River Park, Lane Cove. 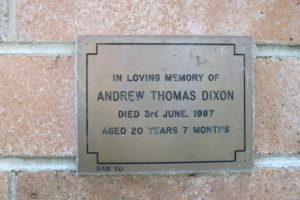 Memorial plaque at Northern Suburbs Crematorium, Delhi Road, North Ryde. 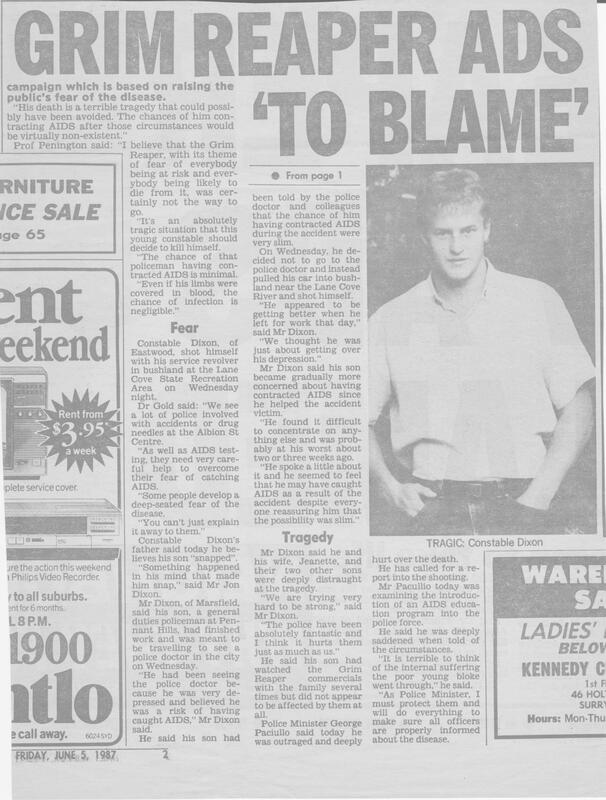 In April, 1987 Constable Dixon and other police attended a serious motor vehicle accident at Mt Colah. A person trapped in the vehicle became violent when released and Constable Dixon assisted in restraining him. During the struggle the constable was covered in a considerable amount of the injured person’s blood. It was later discovered that this person suffered from HIV/AIDS. 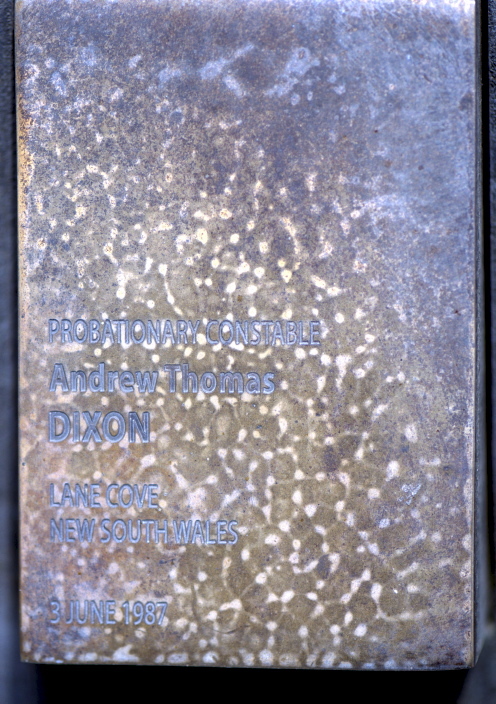 Due to stress and concern over the disease, Constable Dixon drove to the Lane Cove River Park on 3 June, 1987 and committed suicide. The constable was born in 1966 and joined the New South Wales Police Force on 18 August, 1986. 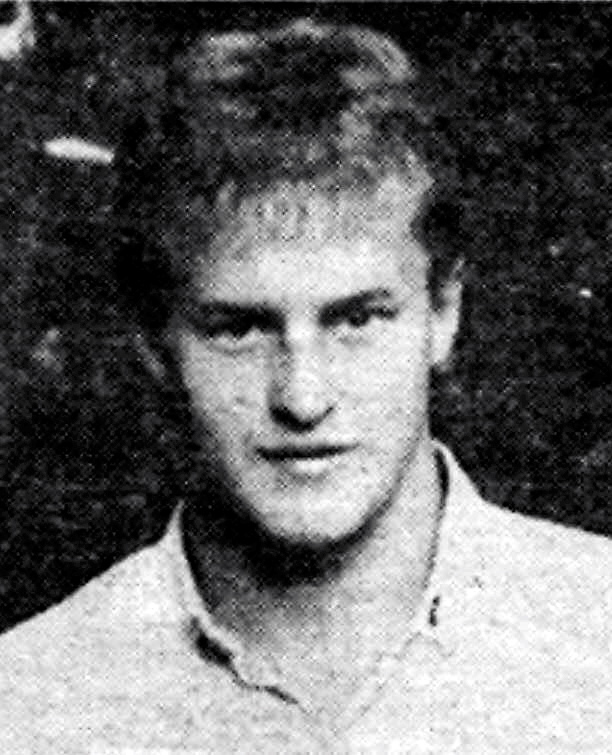 At the time of his death he was stationed at Pennant Hills. From Kevin Banister – I remember this very well. I was working at Pennant Hills when Andrew arrived as a fresh faced Probationary Constable. He was a fine young man built like a brick s**thouse. 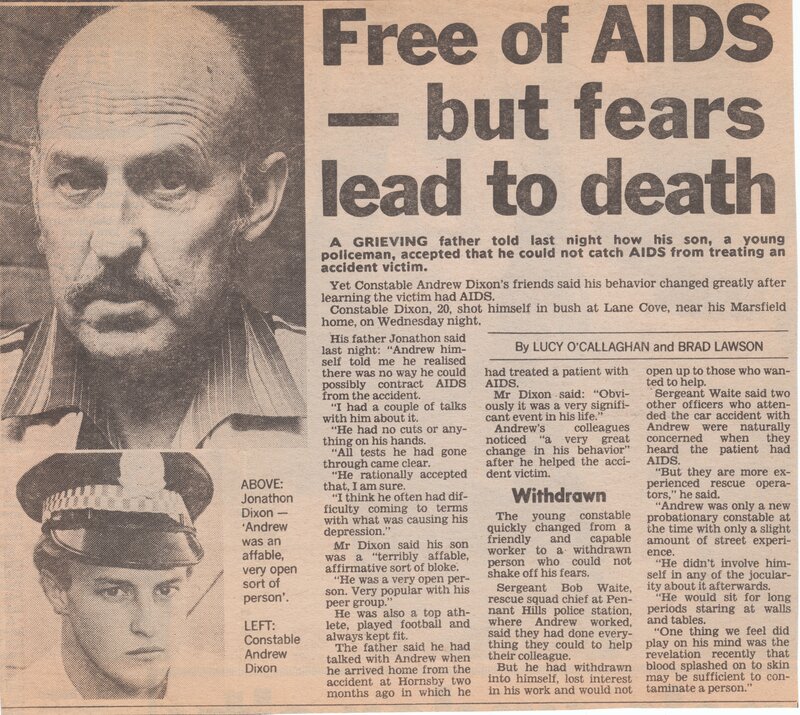 When he was told that the accident victim had HIV/AIDS he began to withdraw very quickly. All at the station were concerned for his welfare and tried to help where possible. On the afternoon of 3/06/87 Andrew had worked morning shift and I was on afternoon shift. At the hand over Andrew said goodbye with a smile on his face and went home, or so I thought. I was not aware that he was supposed to be attending the PMO (Police Medical Officer) for an appointment after work. I got a call from his mother just before sundown to say that Andrew had not come home and were concerned for his welfare. Pennant Hills was a Rescue Squad/General duties station at the time and I was the senior operator rostered on. I made a number of phone calls including to the Lane Cove station and Marickville Rescue base. Not long after we received info that Andrew’s car had been located in a dead end street off Delhi Road beside the Lane Cove river. As a result I and my offsider Bob Hanson attended in the Rescue vehicle. Numerous other Police vehicles arrived along with the Water Police. I organised a number of search parties and headed into the scrub towards the river. Reached the riverbank and saw that the Water Police had also began a search in the area we were in. Again, a short time later I and my offsider found the body of Andrew with his service revolver by his side. I indicated to the Water Police to come over (not using the radio) and told them that they were no longer required. The boat crew saluted and left the scene. A discrete message was sent to the command post as I knew that his parents were at the post and could hear the radio transmissions. When we emerged from the bush with Andrew’s body many of the Police were in tears as he was a local boy and well known. His funeral was standing room only and the street blocked off for the overflow. During the period of the time of the accident and Andrew’s death he had a number of blood samples taken, but due to the technology of the time he was told that it could be some time before they knew if he had became infected. About a month after his death we were informed that he had not become infected. R.I.P. my friend.